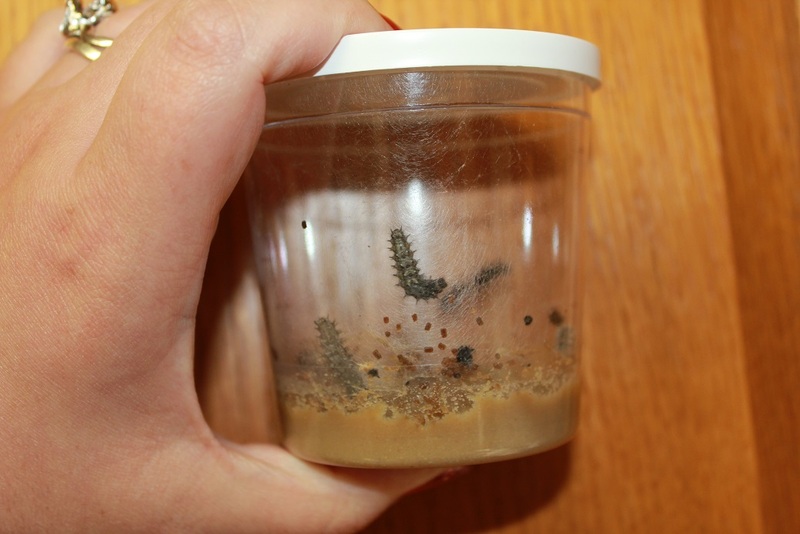 The five tiny hairy black caterpillars arrived approximately a week after I redeemed the voucher online. The jar they were in was pristine aside from a bit of silk and a few nibbles and poops from the sleepy bugs. 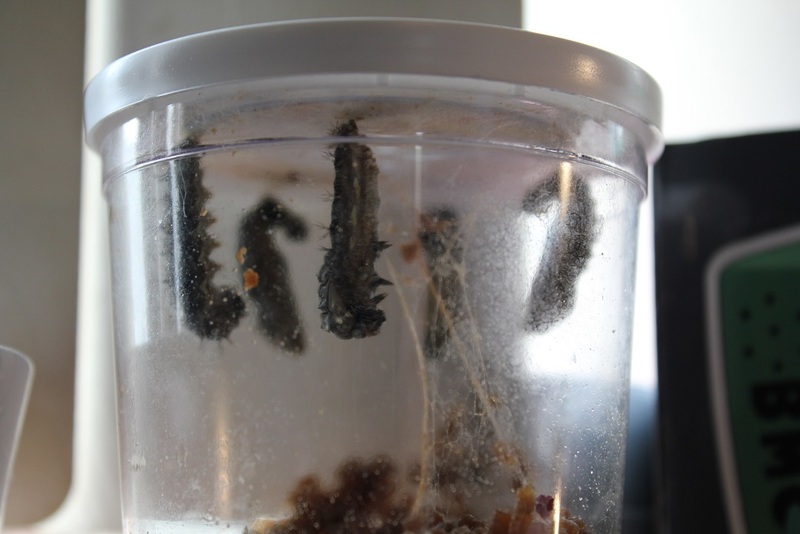 As mentioned previously, the jar contains everything that the caterpillars need until they pupate. The paste in the bottom of the jar is their food and it contains all the moisture they need to survive. 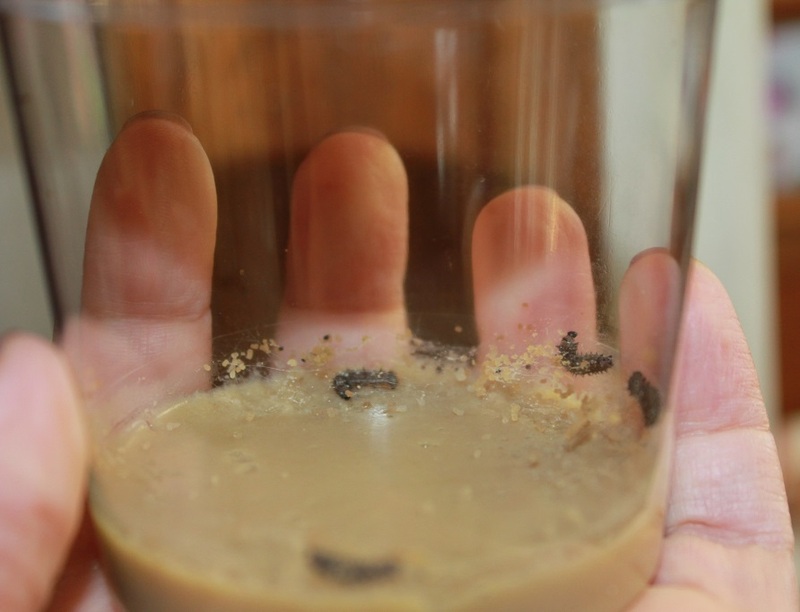 You are not meant to open the jar until they have pupated as that could compromise the integrity of their environment by introducing bacteria or spores to the food. At first we barely saw them move and the only evidence they were even alive was the fact that they were making plenty of poops (which are the same color as the food) Also each time they shed their skin and got larger they left behind the black husks. After a few days I started feeling really badly about keeping them in that jar and the fact that they were eating paste. With the small and large cabbage white butterflies I’d reared in previous years, I could at least give them fresh food every day and clean out the faeces, but these guys are just meant to live in their own waste for two weeks, which isn’t great. I resisted the urge to clean the container though because after a bit of research I realised that their next best fresh food source I could drum up would have been fresh stinging nettles and I was paranoid that it might not work out, so I stuck with being safe and feeling bad about keeping them in the jar of silk and poop. The above photo is the caterpillars at 1 week. As you can see, the poop situation hadn’t gotten totally out of control yet. Behold 2 weeks! (photo above) The poop situation has gone from, ‘you can still eat around it’ to, ‘ok, now you’re probably now just eating your own poo’… The poor tubby caterpillars were also struggling to keep their silk stuck to the inside of the jar as it was so smooth so there was a big pile of silk over the food/poop mountain as well. 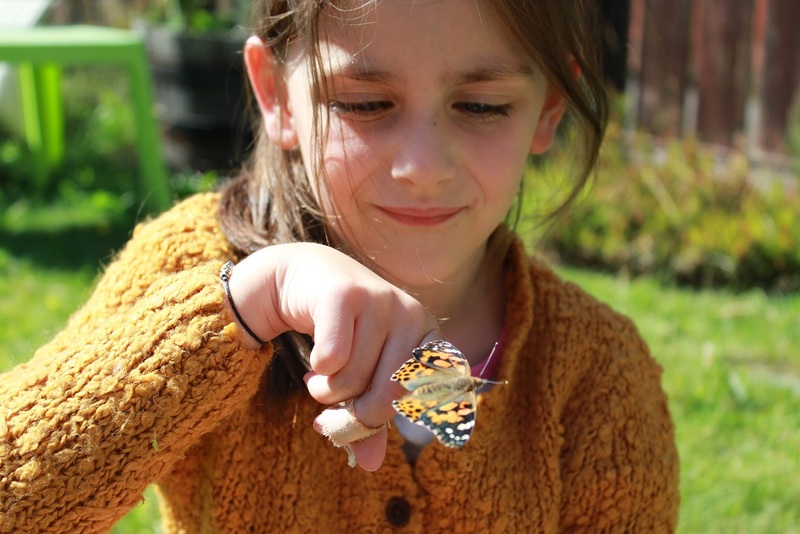 Despite all the silk and poop, both of my daughters really enjoyed being able to observe the caterpillars who were absolutely gorgeous and much more lively than they were the week before. 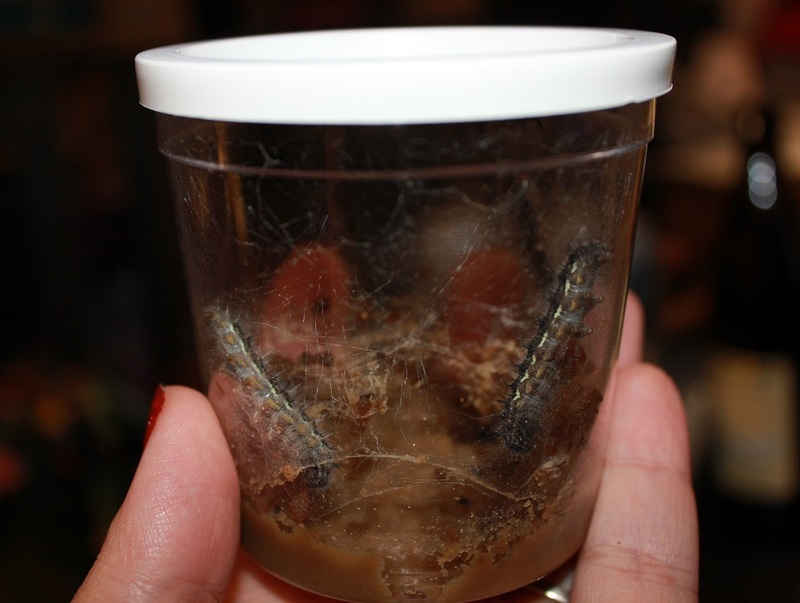 Soon after the second week they pupated. At this point the caterpillars were roughly an inch and a half long. They hung in the J position for about a day and then shed their skins. 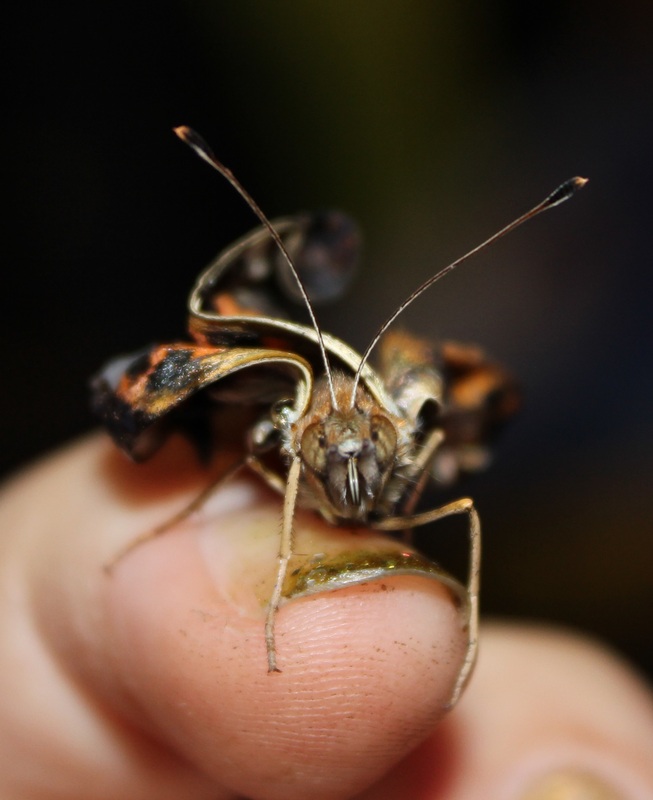 after the skin is shed to reveal the pupa they are well compacted at only an inch long. I was able to observe them shedding their skins for the final time with most of them which was fairly facinating. I was also impressed by the way the caterpillars arrange themselves in such a nearly perfect equidistant fashion on the lid. 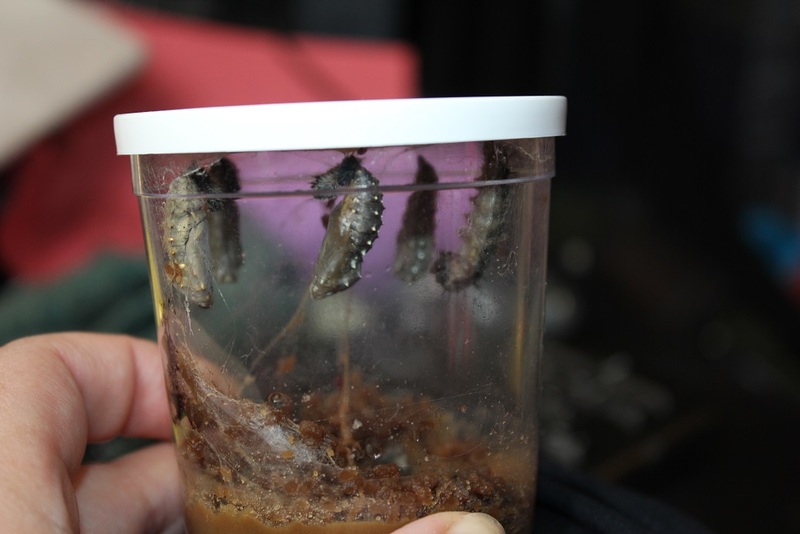 They can still observably shake and wiggle when the pupa is fairly new. This is meant to deter predators, but I’m not entirely sure how as they look pretty damn vulnerable and probably delicious, if you are a bird. The chrysalis takes a day to fully form its spiky points and dry out and they are absolutely gorgeous afterward. I was really surprised by how the points were all tipped in a metallic gold color. Not the stealthiest move by Mother Nature… but she sure knows how to do fabulous. The photo above is of a butterfly about 12 hours away from emergence. You can clearly see the metallic points, the formed wings and the husk of the final moult hanging out at the top. One caterpillar pupated a full day ahead of the other four and before its pupa completely hardened I observed another caterpillar attack it and it bit a hole in the very bottom of the hanging soft pupa. Red liquid, like the meconium that a butterfly expels after emerging from the pupa dripped out of the pupa for the next three days as it seems to lack any sort of natural coagulation. I was certain that there wasn’t enough moisture left inside the chrysalis for this butterfly to live, but there was nothing that I could do to help it. I’m not sure if it felt threatened by the twitching or if it was just really hungry for non-poop paste and it thought that maybe the chrysalis was food. I’ve never observed a caterpillar attacking a chrysalis before, so that was a new one on me. After the crysalises were all hardened I was finally able to separate the lid from the poop jar. I did this carefully and removed all of the silk strands, then stood up the lid in the provided cardboard stand that came in the box with the caterpillars. Ideally I would have then put them in my butterfly tent, but unfortunately I seem to have lost it even though I was positive I knew exactly where it was, and didn’t have the money to buy another one so I made due with a plastic tub which I put some crumpled paper towel in for them to climb. Five days later (that’s 7 days after pupation) the first butterfly broke free and much to my surprise it was the one that I was positive had died! It looked perfectly healthy except for the fact that the two halves of its proboscis never seemed to fully zip together so I’m not entirely sure it was able to eat since that fusion needs to happen pretty soon after it pumps up its wings. At any rate, it flew away just fine and hopefully it didn’t starve to death soon afterwards. In the photo above you can clearly see the dramatic color change that occurs in the chrysalis just before the butterfly is ready to emerge. The two on the left came out the following day and the two on the right were the day after that. The second butterfly that came out was perfectly healthy, but the third unfortunately got stuck inside its chrysalis and as a result its wings are permanently deformed. Half of the chrysalis was still attached to the butterfly when I found it and it had already expelled all of its meconium so it had probably been out for at least a half hour at that point, but it was probably much longer. At first I didn’t think it would survive long as it was barely moving but it has a pretty strong will to live which it demonstrates with its healthy appetite. I can’t let it go as it will almost certainly starve to death or get eaten straight away. 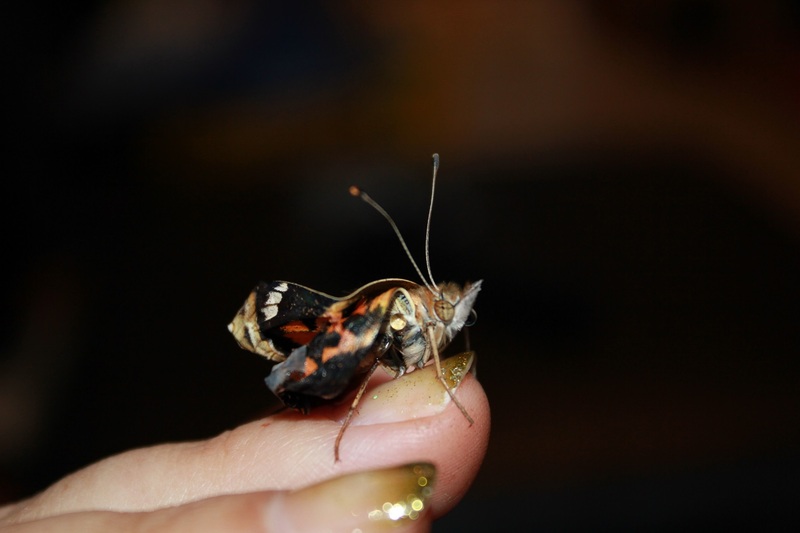 Its legs are ok but not as strong as they should be and it has very limited mobility, so now I guess we have a disabled pet butterfly. Not exactly what I signed up for, but I can’t bring myself to kill it or allow it to suffer starvation or be killed, so this seems to be my only guilt free option. 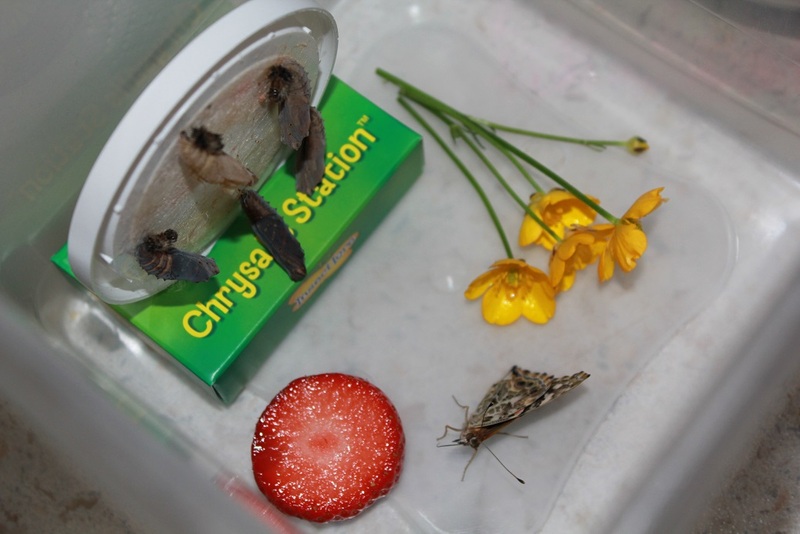 I’ve managed to separate most of the chrysalis from the crumpled wings which has somewhat improved its mobility, but I have no idea what else I can do to help it. Personally I think it’s still beautiful it its own way. 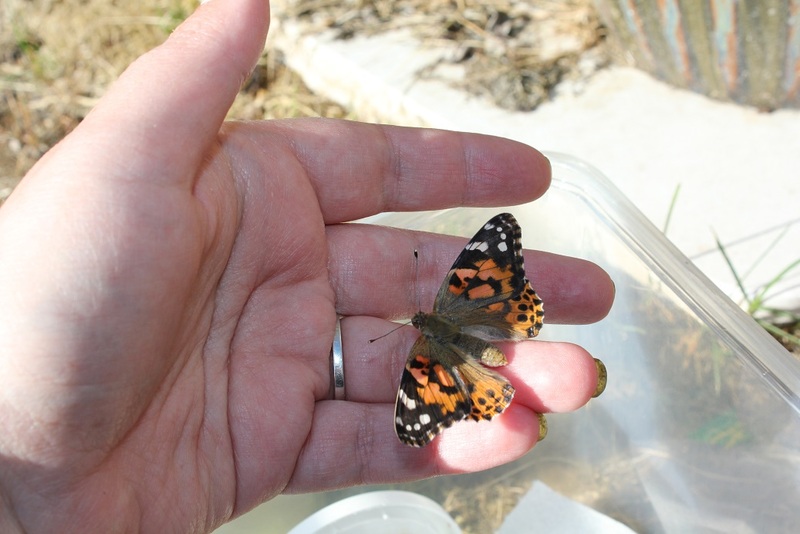 Anyway, the last two butterflies came out just as they should and we released them 8-12 hours later. All in all my 6 year old really enjoyed this experience and my 2 year old thought that it was pretty wonderful too. Even though the caterpillars are really just eating machines I still don’t feel great about the jar of food paste and poo, so I doubt I would ever order caterpillars which I couldn’t easily feed with fresh food again, or clean out but Insect Lore have been doing this for a long time and I have to admit, their system works. 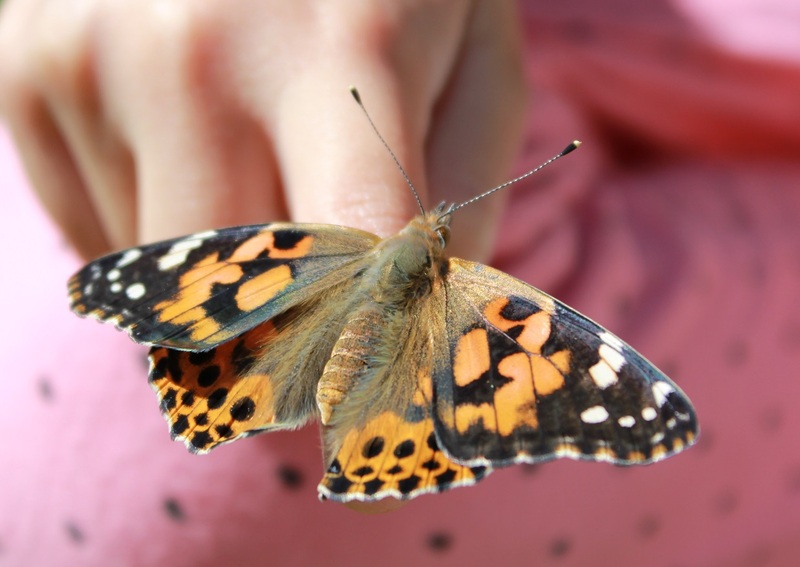 They provide a lot of information with their caterpillars about how to keep them safe and healthy, including how to make nectar for the butterflies. They also send you email updates to notify you when the caterpillars are shipped, when they should be pupating and when they should be emerging as butterflies which I thought was a really nice touch. So I don’t want to knock the company, but I guess this particular method of hands on learning just doesn’t agree with me. Next year I would LOVE to order some Puss Moth caterpillars, but before I do that I need to grow them a food source, so we may be looking at 2020 for that adventure!